Singapore is a fantastic country which is only around 700 square kilometres but its diversity of culture and strategic location has made it a trade hub for centuries. It also has a rich history although it is practically in the past thirty years that Singapore has grown into the financial and economic behemoth which it is today. Although the country has existed since ancient times, settlement by Europeans in the 16th century improved its importance immensely. Its development as an outpost of Empire is crucially important for our understandings of the modern Singapore which we know today. The British came to Singapore in 1819 and the first Governor of the place was Sir Stamford Raffles. It rapidly became one of the most important trading posts of the British Empire since it was crucial in the route between India and China. The natural harbour was transformed into a port which could provide all sorts of maintenance and support to the British merchant fleet. Singapore was the third piece of land to be taken over by the British after Penang and Malacca which became known as Malaya which was incorporated as a Crown Colony in 1867. The Second World War effectively ended British influence in Singapore and this created a situation where there was huge unemployment, economic growth at a standstill as well as infrastructure which went down the drain. However the situation created a nationalist sentiment and political movement which effectively moved forward to independence. Self-governing status was achieved in 1959 while full independence eventually followed in 1963. Although Singapore was part of the Federation of Malaysia, it left in 1965 to become a fully independent country under the leadership of the idealistic and forward looking Lee Kuan Yew as Prime Minister. International observers saw this move as being rather precocious and daring in the context of a bleak economic scenario. As in other British colonies who gained independence, a substantial portion of Singapore’s economy departed when the British left the island for good in 1968 further depressing economic prospects. However what followed was quite an incredible turnaround. Singapore had one considerable tool in its arsenal and that was its Prime Minister, Lee Kuan Yew. This flamboyant and highly talented lawyer who received a British University education at Cambridge decided that the only way forward was to aggressively promote local industry which was based on large quantities of manual labour. Singapore also came up with attractive foreign investment schemes which made the most out of its important strategic location. In just four years the country had 25 per cent of its industry owned by foreign companies or joint ventures with Japan and the United States. Singapore’s political situation was also stable and this resulted in an explosion in economic growth which registered consistent double digit figures in the eight years from 1965 to 1973. The situation continued improving with an economic boom spreading all over Singapore. Hundreds of jobs were created in the private sector where new industries began to sprout up. The government was also very active in the provision of public services especially in the health, housing and transport industries with a resultant boom in public sector employment. There was also the founding of a large fund for social security which continued expanding and is today recognized as one of the largest in the world. This fund makes Singapore one of the best countries for retirement purposes since a wide gamut of social services is provided for those who reach retirement age. The Singaporean government began changing the base of the country’s economy to one of service provision by the late 70’s. The focus was on highly skilled and technology based industries which provided high added value and drastically reduced the labour intensive manufacturing industry which was a major polluter in the country. One of the wisest decisions on the part of the government was to tap into the information technology sector with Singapore now the world’s most important manufacturer of computer accessories. This ranking was actually achieved in 1989, almost a quarter of a century ago. By that year, less than a third of the country’s GDP came from the manufacturing industry. Singapore also forged ahead in the financial services sector and is today still recognized as one of the most important financial centres in the world. In fact the sector accounts for over a quarter of the country’s GDP. 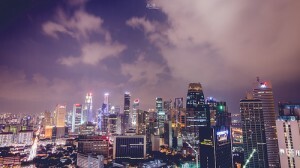 By the late 1980’s, Singapore was on a par with Hong Kong as the most important financial centre in Asia with over 600 multinational companies and thousands of companies in the financial services sector. Singapore has a population of about 5.3 million with 3.2 million of these being of pure Singaporean roots. Half a million are considered as permanent residents in Singapore while the rest are foreigners who work and live there. The country’s population is split along three ethnic lines which are Chinese, Malayan and Indian – this considerably increases the island’s multicultural aspect and allows for a great variety of intercultural communication. Singapore has come a long way from being a sleepy trading outpost in the mid-19th century. It has a number of iconic buildings which survive from the British period but it is also a vibrant modern hub with lifestyle and living of the highest quality. It has also been established on the world sports map with the Singapore Grand Prix, a Formula One race which attracts a vast number of enthusiasts to the country and which is one of the most important events in the sporting calendar. The people are friendly and helpful and this makes the country an ideal magnet for tourism which has grown substantially in the past decades. The financial climate and low taxes make in an ideal spot if you are looking for a place to set up your company or to visit for a period of time. The wide variety of shops, restaurants and other entertainment establishments add to the quality of life whilst data connections which are second to none facilitate business work immensely. Singapore is really a country for the tax nomad in that it is also an island!